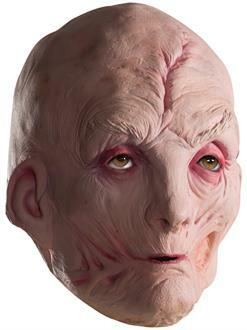 Show your excitement for the new "Star Wars Episode VIII: The Last Jedi" movie by dressing up as Supreme Leader Snoke. This 3/4 vinyl mask is as creepy as he is. Usually only seen by hologram, he'll be depicted fully in the upcoming film. With this mask, you can see up close how odd he is—with a bald head, sunken, mismatched eyes, only a sliver of a mouth and abundant scars and wrinkles. He's seeking to gain control of the galaxy with Kylo Ren by his side. He lured Kylo to the dark side and is hoping to do the same or destroy Rey this time around. Mask is perfect for Halloween or any Cosplay events. Find all your other Star Wars costume needs at BuyCostumes.com.